How long does it take to make a custom Amish quilt is dependent on many things. Because of their lifestyle and the harvest, the time of year is important. The Amish ladies do everything by hand, which includes the canning of fruits and vegetables. Remember, they do not own refrigerators. The fall is also filled with weddings so sewing the gowns and other supplies takes a great deal of time. The estimated time for completion of particular tasks found below is an approximate time. The very first step in making a custom made Amish quilt is designing it. This is when the fabrics and the colors are chosen, and where they will be located on the quilt itself. This might seem simple, but it has to be done to exacting standards of the Amish ladies. Because of this, it can take a week or 2 to complete until the designer is satisfied that the layout will be appropriate. The next step is the acquisition of the fabric to be used in the making of the Amish quilt, along with the batting material. Depending on what design you ordered and the number of different colors that are to be included in your custom made quilt, it can take from 1 to 4 weeks. This is the backbone of the quilt and no short cuts are taken. Once the material is chosen, it will be obtained no matter what the timeframe is necessary for it to be acquired. This is a very important step in making sure the quality of the final quilt is to the Amish quality standards they have been using for over 150 years. The very next step is the creation of the quilt top. This is where the Amish ladies’ artisan skills set them apart from all others. The resulting quilt top will also be what most people notice when they gaze upon the finished Amish quilt. The step takes a minimum of 3 weeks to complete and has been known to take up to 6 weeks when required. It is the detail in the quilt top that is ordered and the number of different pieces of fabric that set the time this task requires. This includes the cutting of all the pieces to exacting standards, then sewing them in place. The next step is the layout for the hand stitching the quilter will follow. As most people know, the quilt has more stitching on it than just merely connecting the different pieces of cloth together. This is when the experienced quilter takes over. 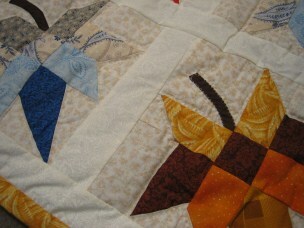 This is the longest task and the one that really sets the Amish quilt apart from all others. It can take 8 to 12 weeks of hand stitching for a quilter to finish her task. The final step is the attaching of the binding edge. This is, again, all hand stitched into place. This final step can take up to a week to complete. 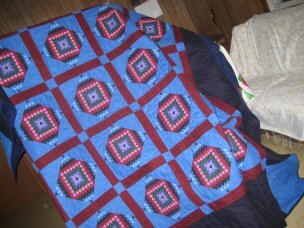 Adding up the numbers, you can have a custom made Amish quilt made in as short as 14 weeks if the conditions are ideal. The longest is 22 weeks. Because of the other activities involved in Amish life, the average quilt requires 5 to 7 months to compete. In special cases, more Amish women can be asked to work on your quilt to meet a specific special date you need it by. If this is the case, please notify the Amish quilter so they are aware of it. You also need to keep in mind that quality takes time.